In my last post for the Magical Blogorail: Peach Line I discussed going to Walt Disney World during a high traffic holiday. Thanksgiving 2010 was a crazy time to go to Disney, but I wouldn't trade that trip for the world! However, in comparison to our trips in January and May of 2009 that had very light crowds, we were packed into the Parks like sardines on that trip! I've always been a little jealous of people who get to enjoy the peak-level Christmas festivities in the Parks with an off-peak crowd, and I'm crazy excited about being one of those people on this trip with Kyle. I am obsessed with crowd level calendars. Kyle would tell you that most weeks I direct message or email him a screen shot of a new one. He's used to this from our last trip, so I think he mostly rolls his eyes at my fascination with numbers, and politely doesn't spoil my fun. This trip, on a scale of 1-10 with crowds being the biggest at a 10, we're looking at 1's and 2's! One site ranked all 52 weeks of the year from best to worst time to visit, and our week is ranked #2 with #1 being the week before our week! Come on, even if you don't care about numbers, and crowds don't daunt you, that's pretty awesome, right?! Ok ok, I'll quit rambling about numbers, and I'll tell you the other reasons that our trip will rock. First, I realized recently that I have seen the The Osborne Family Spectacle of Dancing Lights in Disney's Hollywood Studios twice. Both times it was during daylight hours, and they were not lit. *sad face* This trip we have planned an evening to see the splendor that is the Osborne Lights, and I absolutely cannot wait! Everything, and I mean EVERYTHING is covered in Christmas lights, and you can walk down the streets of America to see all of it. 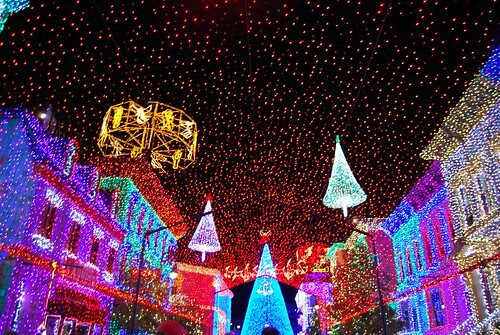 Since the part of Christmas light viewing that I hate is sitting in long lines in a car, this is perfect for me! MVMCP Parade complete with Santa Claus! Second, I've always wanted to attend a MNSSHP (Mickey's Not-So-Scary Halloween Party) or a MVMCP (Mickey's Very Merry Christmas Party) in Magic Kingdom, and this year I get to attend the latter of the two! That means we'll get to see it snow on Main Street, USA, enjoy free Christmas cookies and hot chocolate, and experience the attractions with very small wait times! Also, I bought a super cute outfit to wear that night, and I was looking for an excuse to wear more than just jeans and a t-shirt, so yay! for excuses to dress up! (OK not dressy, but fun... like more sparkles than usual... I realize that might be scary to some of you.) When we started planning the trip, Kyle mentioned MVMCP like it was a given that we would go. I'm glad that was his attitude toward it because I'm not sure I would have even dreamed of it until it was sold out. Finally, I got a tweet from Kyle a little while after we paid for our trip that said our trip was going to be "legen... wait for it... dary" or something along that line with a link to this page. That's right! HE's going to be narrating the Candlelight Processional! Who is HE? You can't figure out my excitement from the list? It's the one and only Dr. Horrible, Barney Stinson, Glee guest star, Broadway-singing, Doogie Houser, MD: Neil Patrick Harris! He is without a doubt one of my absolute favorite actors, and he will be at EPCOT in the flesh! I just know we'll run into each other in the Parks, and I'll casually mention that I teach math, and he'll ask me to be their live in math tutor for their child, and I'll just have to say yes, and then I'll be able to afford WDW whenever I want it, and I'll ... ahem... I mean, how awesome will it be to see NPH narrate the Candlelight Processional?? And I shall pretend he is smiling at me and me alone! Of course once we saw that he would be the narrator, we had to snag a Lunch Package to ensure we'd get seats to hear his narration, and that includes some reserved seating for IllumiNations. How great is that? I know this is horrible audio, but I loved this moment on Glee when NPH guest-starred, so here it is for your enjoyment. Our first night we'll be heading over to Fort Wilderness for the Hoop-Dee-Doo Revue which I'll talk about more in the where we're eating post, but that's another night of awesome that we'll be having! It's going to be an event-packed, amazing Christmas at Disney World vacation, and I am more and more excited about it every day! Next post I'll share where we're eating our sit-down meals. I'm excited for you! We scheduled Hoop Dee Doo for our first night in the World (for our trip coming at the end of January) - we've never done it before, so I'm excited. How exciting! My husband and I are talking about trying to go while he's narrating. That's awesome that you guys got a lunch package for it! So cool! DIY Disney Craft Project & Giveaway! Where Do You REALLY Want to Eat? I Can't Wait to EAT!! !